Complete and submit the Application Form provided with a $100 non-refundable application fee payable to Pilates Core Integration. 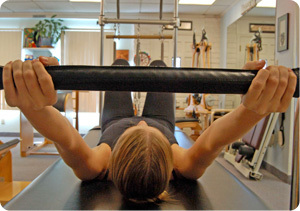 Submit a resume that tells us about your professional & Pilates background. Complete and submit the Apprenticeship Agreement form provided. Submit one letter of recommendation from your Pilates instructor. You will be notified by mail once you are accepted into the Teacher Training program. Once you choose your workshop location, pay a deposit of $200 to the main Pilates Core Integration administrative office in Tempe AZ 60 days prior to the workshop ($400 deposit required for back-to-back Tempe summer workshops). You will receive more specific information about the workshop location and times upon our receipt of your workshop deposit. All workshops must be paid in full 30 days before the date that the workshop is scheduled to begin. Contact the Tempe office at 480.731.3101 for additional information. Make checks payable to "Pilates Core Integration".